The Pittsburgh Penguins have re-signed defenseman Carl Sneep and forward Keven Veilleux to one-year contracts, it was announced today by executive vice president and general manager Ray Shero. Both players signed two-way deals worth $525,000 at the NHL level. Sneep, 24, made his NHL debut this past season, notching an assist against the Buffalo Sabres on Dec. 17. The 6-foot-4 blueliner spent the majority of the campaign with Wilkes-Barre/Scranton of the American Hockey League (AHL), tallying 10 assists and a plus-5 rating in 40 regular-season games. Pittsburgh’s second-round draft pick (32nd overall) in 2006, Sneep has played in 101 career AHL regular-season games, notching 27 points (4G-23A) and a plus-22 rating. 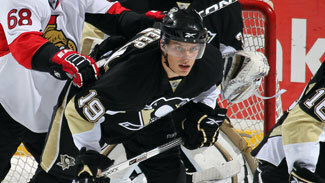 The St. Louis Park, Minnesota native has also appeared in two AHL playoff games for WBS. Sneep played four seasons of collegiate hockey at Boston College from 2006-10, winning a pair of NCAA national titles in 2008 and ’10. Sneep’s best year came as a senior in ’09-10 when he established personal bests with 11 goals, 17 assists and 28 points – earning him a spot on the All-Hockey East honorable mention team. Veilleux, 23, missed the entire ’11-12 season due to a knee injury. The 6-foot-5, 218-pound forward has played in 75 career AHL regular-season contests with WBS, totaling 14 goals, 25 assists, 39 points and 134 penalty minutes. Veilleux has added four points (2G-2A) in 11 AHL playoff games. Veilleux, who hails from Saint-Renee, Quebec, split four seasons of junior hockey between Victoriaville and Rimouski of the Quebec Major Junior Hockey League (QMJHL) between 2005-09. He tallied 59 goals, 187 points and 17 power-play goals in 193 regular-season games. Veilleux was drafted by the Penguins in the second round (51st overall) of the 2007 NHL Draft.